MERRY CHRISTMAS, from all of us at Golfers on Golf. Standing L-R Mike Munro the former owner of the White Pines Golf Dome, Ed Stevenson Director of Golf Operations for the Dupage County Forest Preserve District. Seated Rory Spears (L) and Bill Berger PGA Life Member and owner of Bill’s Pizza and Jake’s Pizza of Franklin Park. 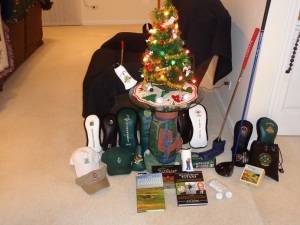 All of us hope you get all the great golf gifts you are looking for from Santa, family or friends. Mike Munro is still hanging out at the White Pines Golf Dome, stop and hit balls with your new clubs. 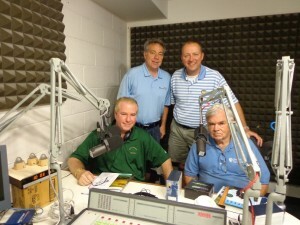 Ed Stevenson will help you get goodies from Dupage Golf. Billy will serve you up a great pizza at Jake’s. I will be out at some of the domes over the next couple of weeks, getting ready for the golf that is to be played around the PGA Merchandise Show in January. Stop and say hello, if your out hitting or rolling a few yourself. I’m anxious to get 2015 rolling, I hope you are too. See you on the tee, now go enjoy the day and here’s hoping there is a golf gift under the tree for you. You can friend me on FB, connect with me on Linkedin, or follow me on Twitter @GogBlogGuy.